If you have already read our first part of this two-part blog, you will have learnt about some of the potential toxic threats that can often reside in our homes. So, in part 2 we would like to look at the natural and gentler alternatives that can be easily implemented and included in your home cleaning routines and beauty routines. It really is simple and it does not mean that you have to forgo your favourite home rituals. So, here are some of the top alternatives and recipe ideas we have put together for you all. There are a huge variety of natural alternatives to aerosol sprays, whether they be furniture polishers, room fragrances, body sprays and much more. This basic and easy to use recipe can be adapted by changing the essential oils in it to make whatever sort of sprays you need on hand in your home. 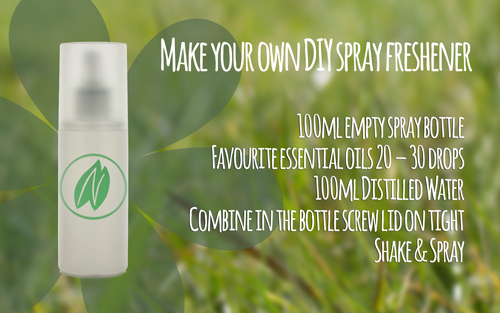 Simply take your 100ml spray bottle and fill it with the distilled water. You may need to use a small funnel depending on the size of the bottleneck. We like to blend a combination of 10 drops of Sweet Orange, 10 drops of Lavender and 10 drops of Lemon for a real feel good, happy room spray. Shake well each time before use, to make sure the oils are mixed through and then spray the resulting beautiful natural fragrance to your heart's content. A great way to make the switch from liquid soaps that contain triclosan to natural alternatives is really easy: you can buy a large batch of unscented castile soap, decant it into an empty liquid soap dispenser and just add the essential oils that you wish to benefit from. This method also works for dish soap, shampoo, body wash, hand wash and multi liquid cleaners for bathrooms or kitchens. Using combinations of essential oils with castile soap is such a versatile way to make any liquid based product you wish to use. Take your empty liquid soap dispenser, fill it just under full and then add: 10 drops of Cedarwood atlas, 10 drops of Tea tree and 10 drops of Rosemary (blend based on roughly 250ml). Screw the lid on tight and give the bottle a good shake to combine the castile soap and essential oils. Simply apply as any regular anti-dandruff shampoo. You could try this blend of essential oils - tea tree, lemon & lime (10 drops of each) to make a dish soap. There are a few different natural beauty and skin care brands out there that already offer natural deodorants free from parabens or aluminium powders, but if you want to be brave and have a go at making your own homemade deodorant, then here are some ideas for you. Combine the dry arrowroot and baking soda in a bowl. Add the coconut oil spoonful by spoonful working it into the baking powder and arrowroot until they reach a paste-like consistency. Add between 5 to 10 drops of your favourite essential oil (tea tree and lavender are great ones to use for their anti-bacterial properties). That is all we have for part 2 of "Why Natural is best for you and your family" and we hope you were able to find something here to help you make the switch to a cleaner and greener you. If you try any of the recipes or would like to share your own tips to avoid harsh chemicals in the home, we would love to hear from you! Hi Jenny, Thank you for sharing your fantastic tips with us some really interesting ones there we shall have to try some for ourselves! We absolutely love coconut oil too! So happy you love our products and our pulse points have a lovely day! Hi Eileen, it is wonderful to hear that you are looking for ways to integrate more natural homemade products into your lifestyle. The best place to get a hold of distilled water will be at your local chemist or to order it online. We would love to hear how you get on with your aerosol replacement too. I use sodium bicarbonate to wash my hair! I saw people doing this on youtube originally but my method is slightly different. I put 1 heaped tsp along with 1 drop essential oil into a large glass, then fill to about 3/4 full with warm water & mix. Distribute through hair & rub into scalp. Rinse, then to re-acidify hair (as bicarb is alkaline) I add 1 dessertspoonful lemon juice to a glass of cold water, pour through the hair & comb through. Lastly, rinse again and then I rub a very small amount of coconut oil into my scalp to moisturise. My hair looks really clean after this & I no longer have to use hair straighteners as there's no frizz! The essential oils can be varied, I particularly like lavender for an irritated scalp or may chang for a fresh scent. I love your products by the way, especially the all-natural pulse points, I much prefer using them to synthetic perfumes! Thank you for this easy to follow article. I have been looking for ways to integrate more homemade, natural solutions. I am particularly interested in experimenting with an aerosol replacement, can you tell me where I can find distilled water?